MNHS Senior Postdoctoral Fellowship awardees Dr Elizabeth Zavitz, Dr Phill Pymm and Dr Marion Boudes. 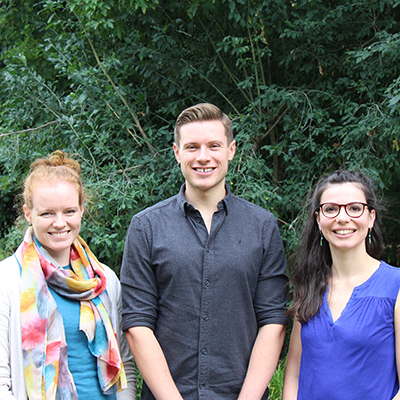 Three postdoctoral researchers from the Monash Biomedicine Discovery Institute (BDI) have received Senior Postdoctoral Fellowships from the Faculty of Medicine, Nursing and Health Sciences (MNHS). These Fellowships are targeted at outstanding candidates who have clear potential to be successful in external career fellowship schemes, and have four to six years postdoctoral experience. Five Fellowships were available, with three going to Monash BDI’s Dr Marion Boudes from the Elmlund lab, Dr Phill Pymm from the Rossjohn lab, and Dr Elizabeth Zavitz from the Price lab. Congratulations to each of these researcher on their success. Genome expression is constantly adjusted so that the right gene is expressed in the right cell, at the right time. Epigenetics markers, such as histone modifications, control which genes are switched on or off. These modifications are themselves governed by master regulators such as Spt-Ada-Gcn5 acetyltransferase (SAGA). This large −1.5 MDa− protein complex is conserved across the eukaryotic kingdom and performs two different histone-modifying functions, localised in structurally distinct modules. Additionally, SAGA interacts with diverse partners; these interactions modulate its chromatin-modifying activities, allowing stringent regulation of genome expression. In addition to being universally required for transcription of protein-coding genes, SAGA is involved in numerous processes such as mRNA splicing, mRNA export or DNA repair. Despite the pivotal role of SAGA, scientists currently lack high-resolution structural information of the whole complex, as well as molecular-level understanding of the interactions between SAGA and its partners. This limits understanding of how its different functions are integrated to balance gene expression. Dr Boudes will use cutting-edge single-particle analysis cryo-EM to dissect key knowledge gaps on the determinants of SAGA’s functions. The results will be used as a strong foundation to strengthen scientists’ appreciation of SAGA’s contribution to regulation of genome expression and maintenance across the entire eukaryotic kingdom, engendering new perspectives towards explaining how all living organisms adapt to their environment. The recognition of human leukocyte antigen class I (HLA-I) ligands by the killer cell immunoglobulin-like receptor (KIR) family acts as a critical set of immune checkpoints for natural killer (NK) cells, modulating their activity to regulate NK driven innate immune responses. Both receptor and ligand families are highly polymorphic and their interaction is additionally dependent upon the repertoire of peptide epitopes presented by HLA-I. KIR contain both activating and inhibitory family members and the locus is variable in both gene content and copy number in a given individual. Many KIR family members are highly associated with the effectiveness of innate immune responses and have significant impacts on disease course and immune disorders. They are additionally implicated in the development of hypertensive pregnancy disorders including pre-eclampsia due to their involvement in remodelling of the decidua during early pregnancy. To date the extreme variability of these receptor-ligand interactions has prevented us from determining the molecular underpinnings of how NK cells contribute to immune outcomes and has therefore severely limited their use in therapeutic settings. Dr Pymm’s work aims to address this knowledge gap through systematic assessment of ligand specificity and functional impact of the KIR family on NK cell activity. Dr Elizabeth Zavitz: How do cortical circuits represent abstract categories? Dr Zavitz’s project aims to demonstrate the presence, computation, and use of a neural mechanism that represents abstract categories, using the case of texture representation in the visual cortex. The proposed approach is interdisciplinary and combines image analysis, electrophysiology, and computational modelling. This study may provide a unique opportunity to gain insight into a pervasive neural computation: abstraction. The intended outcomes of this project relate to neurally-inspired computation; a growing industry that includes artificial intelligence and machine learning. Tasks like driving, analysing satellite images for military intelligence, or medical images to evaluate disease are on the cusp of automation. By increasing understanding of how the human brain computes, we may benefit industry by accelerating these fields. Better automation benefits health and safety by guarding against human error.